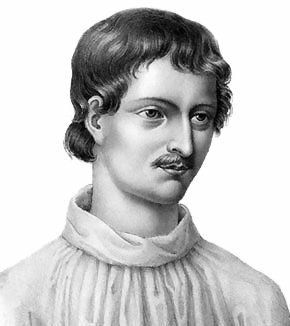 Giordano Bruno, a Dominican friar, philosopher and cosmological theorist who challenged orthodox Christian beliefs in the 16th century, died on this day in 1600 when he was burned at the stake after being found guilty of heresy. 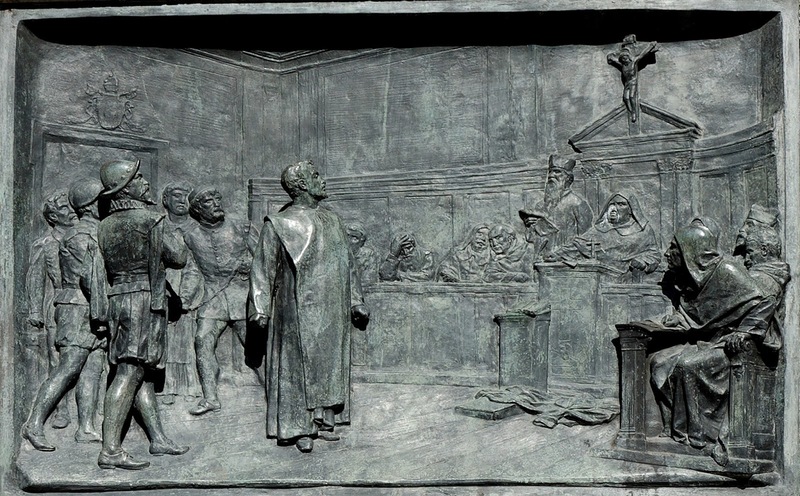 The principal crimes for which he was tried by the Roman Inquisition were the denial of several core Catholic doctrines. Bruno challenged the divinity of Christ, the virginity of Mary, and the transubstantiation - the idea that Eucharistic offering of bread and wine in Mass becomes the body and blood of Christ. He also questioned the idea of God as a holy trinity of divine persons - the Father, the Son (Jesus) and the Holy Spirit. His own belief was closer to pantheism, which contends that a God is an all-encompassing divine presence rather than existing in some personal form with human traits. This idea formed part of his cosmological theory, in which he supported the idea that everything in the universe is made of tiny particles (atoms) and that God exists in all of these particles. 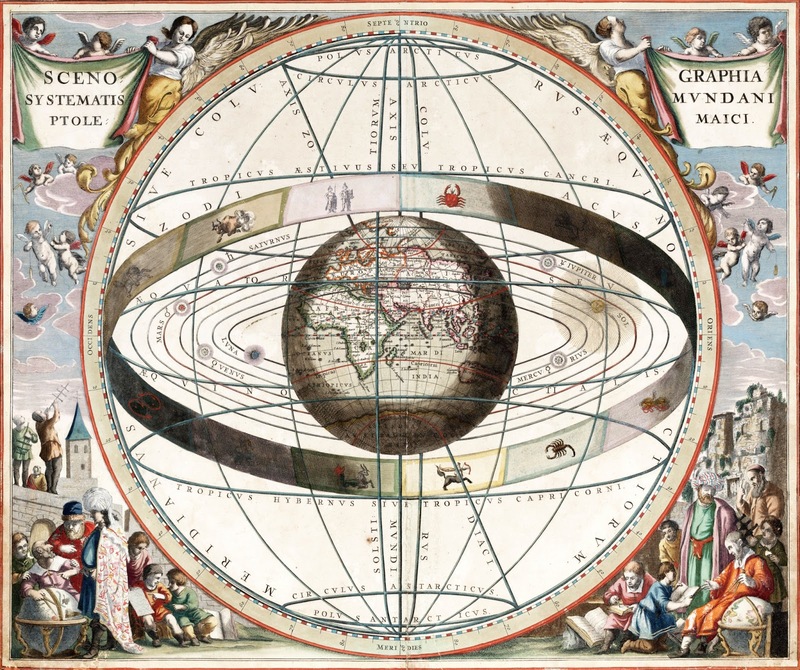 Yet this was in contradiction of the established Catholic wisdom, as was his support for the idea advanced by the Renaissance astronomer Nicolaus Copernicus that Earth revolved around the sun, rather than the other way round. 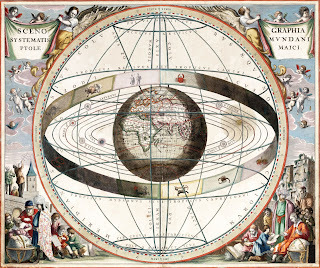 Bruno took this one step further by suggesting that the sun, which Copernicus placed at the centre of the universe, was in fact merely one of an infinite number of suns in an endless universe, each of these suns being surrounded by planets, and that Earth was likely to be only one of many planets inhabited by living beings. After many years essentially on the run, Bruno was imprisoned in Rome in 1592, subjected to periodic torture and finally condemned to die by immolation, the sentence carried out in Campo de' Fiori, where he was stripped naked, with his tongue tied down to prevent any heretical outbursts, and suspended upside down before a fire was lit beneath him. 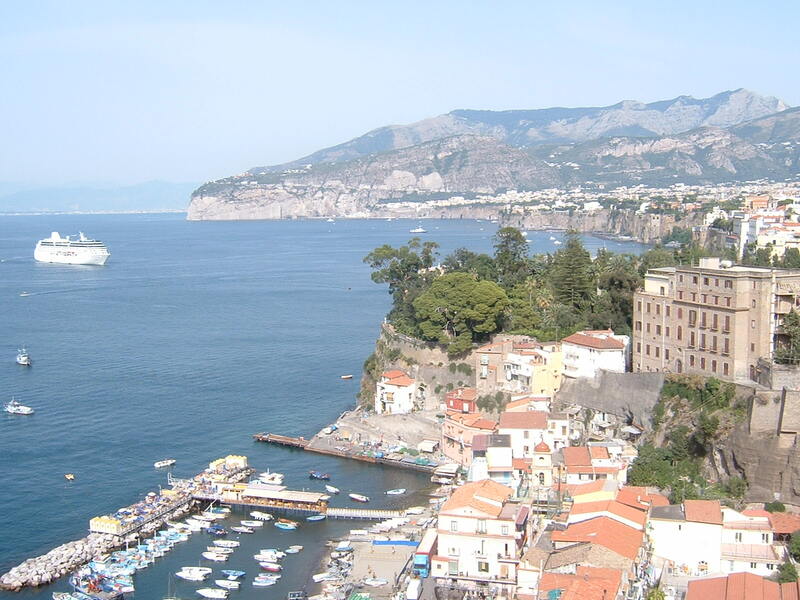 Bruno had been born Filippo Bruno in the town of Nola in what his now Campania, on the north-eastern slope of Vesuvius. He moved to Naples to study at the age of 14 and entered the monastery of San Domenico Maggiore at the age of 17, taking the name of Giordano. He remained there for 11 years but in that time became known for questioning accepted beliefs. He removed images of the saints from the walls of his room, keeping only a crucifix, took an interest in Arab astrology and obtained copies of banned texts, which he encouraged others to read. He consistently expressed doubts about areas of the Catholic faith that seemed to be contradicted by science and logic. On learning that an indictment was being prepared against him in 1576, he fled Naples, casting off his monk's habit in the hope that he would be less easily recognised. 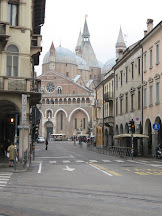 For the next 15 years, he travelled around Europe, initially in what is now northern Italy, where he spent time in Genoa, Turin, Venice, Padua and Bergamo, and then in Switzerland, France, England and Germany. He taught at a number of universities but his views often brought him into conflict with his superiors and inevitably meant his postings were short-lived. In London he courted controversy by his association with magicians and astrologers. His most settled time was in Paris, where he made money by demonstrating his immense powers of memory, which he honed using techniques that were ahead of his time and appeared to give him superhuman qualities. 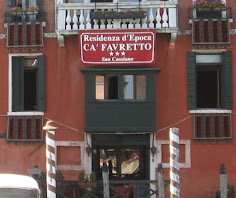 Bruno's fatal mistake, it turned out, was to accept an invitation from Giovanni Mocenigo, a wealthy Venetian, to return to Venice as his personal tutor. Mocenigo had been impressed by some of Bruno's writings, published while he was in Paris, and had heard of his prodigious memory, but after a while the two fell out, Mocenigo accusing Bruno of paying too much attention to his wife and of failing to pass on his most effective memory tricks. 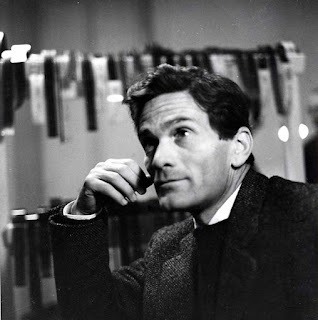 Bruno gave notice of his intention to quit and planned to move to Germany but Mocenigo locked him in an attic, threatening to hand him to the Inquisition if he did not reveal the secrets behind his feats of memory. 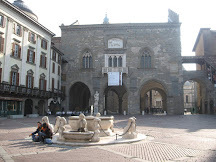 He refused to do so and Mocenigo promptly summoned the authorities, not only handing over Bruno but a three-page letter alleging various acts of blasphemy and heresy. 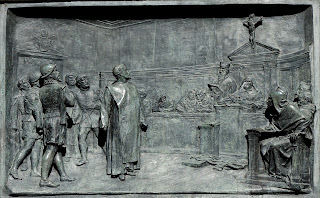 The Inquisition required the testimony of more than one individual to mount a successful prosecution. No one came forward to support Mocenigo's claims but it seems Bruno damned himself by admitting that he had always harboured doubts over Jesus's claim to be the son of God. 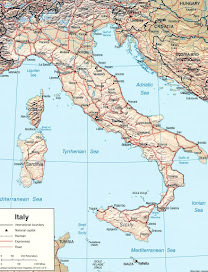 Although he retracted the beliefs attributed to him in Mocenigo's statement, Bruno remained in custody long enough for the authorities in Rome to apply successfully for his extradition. He was imprisoned in Castel Sant'Angelo for the next eight years and regularly invited to recant but refused to budge on most of his beliefs, challenging Cardinal Robert Bellarmine, the chief Inquisitor, to prove that he was wrong. Years after his death, he was hailed as a martyr of science and revered for standing up to the power of the papacy. In the spot in the Campo de' Fiori where Giordano was executed there now stands a monument to him in the form of a statue created in 1889 by Ettore Ferrari, the Grand master of the Grande Oriente d'Italia, the Masonic jurisdiction of Italy, who were strong supporters of the unification of Italy over the previous Papal rule of Rome. The statue shows Giordano dressed in his monk's habit but wearing a defiant expression on his face. 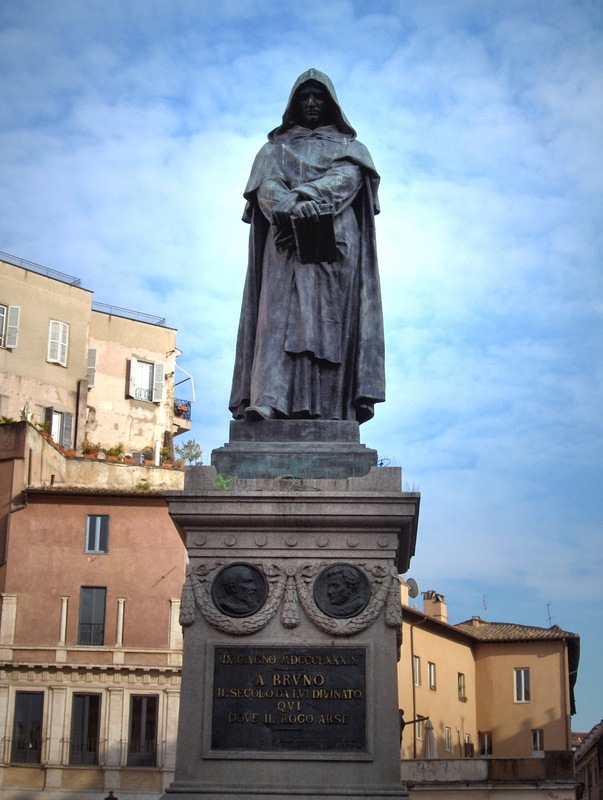 Each year, on the anniversary of his death, the statue becomes a site of pilgrimage for groups of Masons, atheists and pantheists, for whom Giordano has become a cult hero. 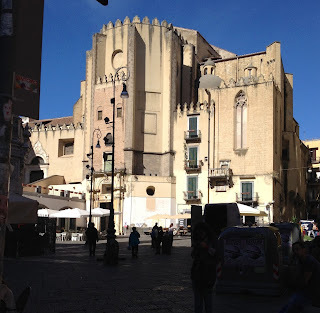 The church of San Domenico Maggiore, founded by the friars of the Dominican Order, is located in the square with the same name off Via Benedetto Croce, a section of the street known as Spaccanapoli. In the centre of the square is an obelisk topped by a statue of Saint Dominic, founder of the Dominican Order, erected after the plague of 1656. 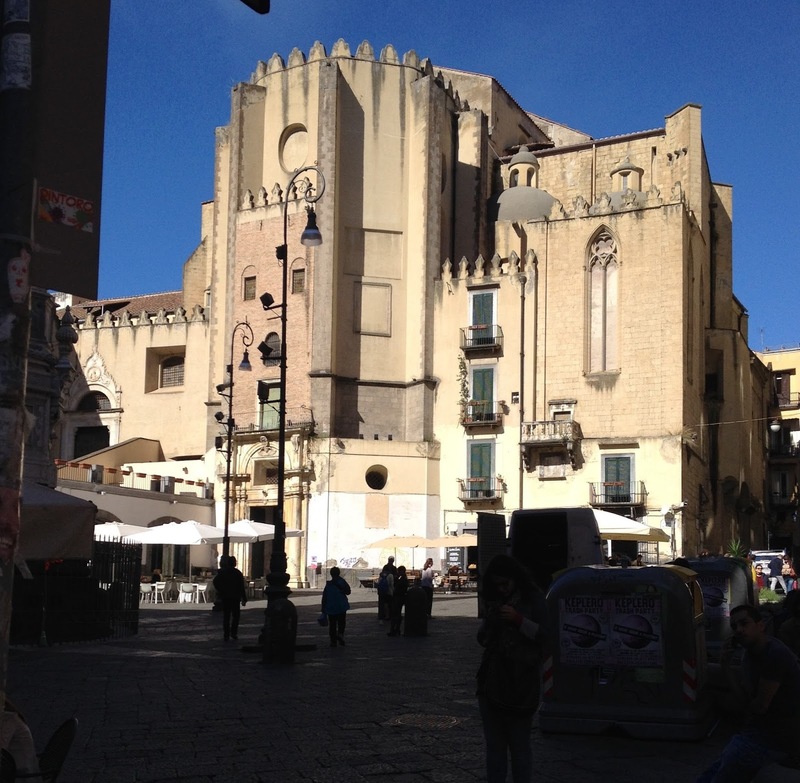 The monastery annexed to the church was the original seat of the University of Naples.